Julie Vézina, Director – Québec Office, Canadian Tax Foundation, winner Katherine Borsellino and Manon Thivierge, Partner, Taxation, Osler. Alumnus Katherine Borsellino (Master of Laws (LL. M.) – Taxation option) has won the Canadian Tax Foundation (CTF)—Osler Hoskin & Harcourt Award for best student paper of 2017-2018 in the province of Québec that deals with an aspect of Canadian taxation. 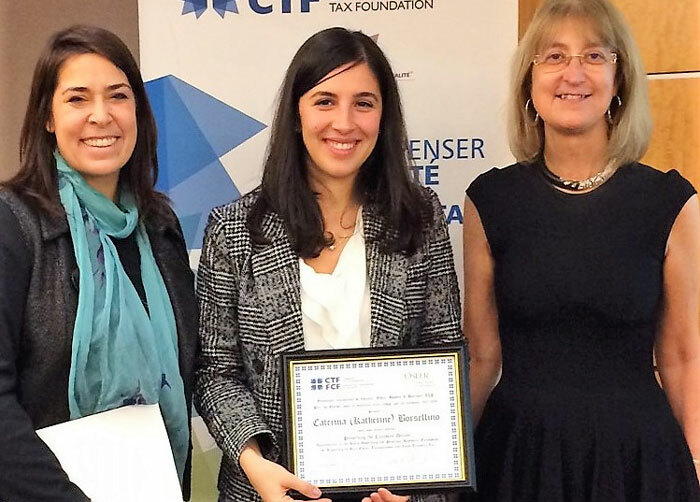 Currently Tax Manager at Richter, Borsellino received this honour at a luncheon conference organized by the CTF in Montréal on November 16, at which she gave a talk. The winning article, Preserving the Canadian Dream: Amendments to the Rules Governing the Principal Residence Exemption, the Reporting of Real Estate Transactions and Land Transfer Tax, gives an overview of certain federal and provincial tax measures that were put in place to promote a stable housing market and to preserve equity in the tax system. Each year, the Foundation offers up to four regional awards for the best student papers (Atlantic Canada, Québec, Ontario and Western Canada). Judged by a committee of three independent reviewers, the winning articles are published in the Canadian Tax Journal, and each winner receives $2,000.